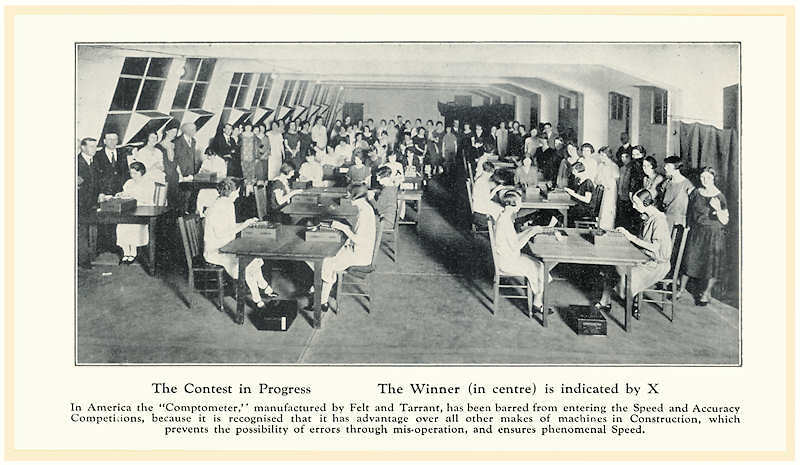 Comptometer "speed and accuracy" competitions were organised by Felt & Tarrant and their agents in many locations during the 1920s and 30s. While originally intended to showcase the skills of the operators, the competitions were also used to good advantage to demonstrate the superiority of the "Controlled-Key" Comptometer over the "old-style" machines - specifically, the cheaper and agressively marketed Burroughs Calculator, which had none of the Comptometer safety mechanisms. The text and photos following are taken from an advertising brochure prepared by Felt & Tarrant's Australian distributors (Peacock Bros.) following a competition in Melbourne in 1925. Note the operators' wages of 1/3 (one shilling and threepence, or 12 cents) per hour. Nearly 100 Competitors entered for the Contest, which was held at Peacock House, Melbourne, on Wednesday, 28th October, 1925. Columns of figures of 31 items, an average of 5 figures to each item, were set before Competitors. The Contestants were divided into 3 groups of about 30. The Operators who added the largest number of columns to be adjudged the Winners. Mr. Muggleton, of the Vacuum Oil Company and Miss Wright, of the Postmaster General's Department, supervised the Competition in the interests of Employers and the Public. Mr. Conrad, of C. M. Brooke and Sons, Mr. Hurrell, of Customs Department, Mr. Read, of International Harvester Co., Mr. Chambers, of Cyclone Pty. Ltd., Mr. Mathers, of British Imperial Oil Co., Mr. Sullivan, of Tramway Board, Mr. Budden and Mr. Clayton, of Nestles,checked the results. 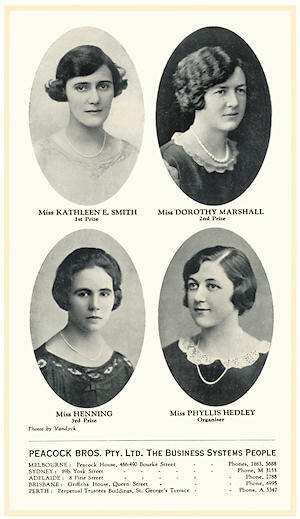 1st Prize, Miss Kathleen E. Smith, of B.A.W.R.A, 60 Columns. 2nd Prize, Miss Dorothy Marshall, of Metpn. Gas Co., 58 Columns. 3rd Prize, Miss Henning, of Vacuum Oil Co., 54 Columns. 49 Competitors qualified for Efficiency Certificates by obtaining 50% of the Winner's record. The Winner added 9,500 figures, wrote down 60 answers and turned over pages, in 30 minutes, adding at the rate of 5 figures per second. The most phenomenal feature was not the high speed, which was a world record, but that anybody could add 9,500 figures without a single mistake. This could only be achieved on the Controlled Key Comptometer, which absolutely prevents mis-operation. Of the 49 Competitors who qualified for Efficiency Certificates, all (except 4) used the Controlled Key Comptometer. The following interesting statistics have been compiled, showing the advantages of the Controlled Key Comptometers over the old style machines. Comparison of Results obtained by an equal number of operators using the Controlled Key Comptometers and the old style machines. Operator @ 1/3 per hour plus 33 1/3% on Controlled Key Machine: cost 1 /8 per hour. While the same work on Non-Controlled Key cost 4/6 ; savings, 2/10 per hour. Working only 2 hours per day ; saving 5/8 per day, £1/14/- per week, £88/8/- per annum, £442 in 5 years. Original text and images Copyright © John Wolff 2011.